As an agent, you can get your own branded Agent App to easily distribute to clients, with all calls and emails going to you. Today more than 80% of Americans have smartphones—and according to NAR, the majority of home buyers use their phone or tablet to search for their next home. 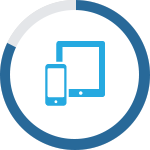 This means mobile devices such as smartphones and tablets are the ideal place to engage with and stay top of mind with past clients as they use your app. Smarter Agent offers a simple solution: a unique app that is branded to you that is a powerful mobile tool directly linking you to homebuyers. Buyers can access and search all MLS listings with you in mind from their mobile phones and mobile devices. You will also have access to search data from your buyers, helping you hone in on just what property will be the best for them.